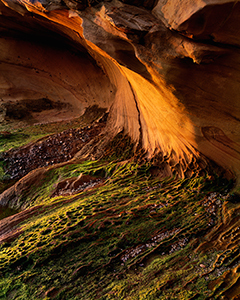 This course will address various aspects of color landscape photography that pertain to advanced elements of lighting, composition, exposure, previsualization, and intention through both field and studio critiquing sessions. While the instructor's concentration has long been that of traditional large format film – which will in fact be demonstrated to whatever extent there is interest among the students – digital equipment is of course encouraged, with accompanying discussions of the relevant techniques. The emphasis will be on outdoor settings and applications, with a bit of direction on indoor still lifes. While the external and internal world around us has undergone massive transformation – together with the visualrecording technology itself – composition itself will remain a primary focus of discussion. We will endeavor to remove the clutter, the obvious, the clichéd from your landscapes ... to create memorable images with a distinctive personal approach. Through field demonstrations, lectures, slideshows, and individual reviews, the aim will be to help participants pare their vision down to its essential elements and nothing more, and to understand the critical lighting decisions that allow this to be realized. Photographers with at least a basic understanding of imagery workflow and the manual camera mode are encouraged to participate. 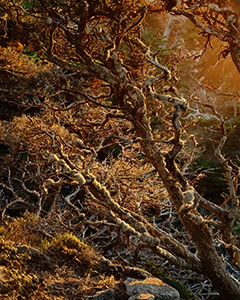 With additional emphasis upon carefully targeted post-processing skills available with Photoshop and even Lightroom, the hope is to come out of this experience with fresh insights for honing your skills to take your landscape photography to the next level, using one's own unique visual voice. Ken will also be available to assist with the important processes of editing, sequencing, and assembly of athematic body of work into a finished portfolio, exhibition, or book. 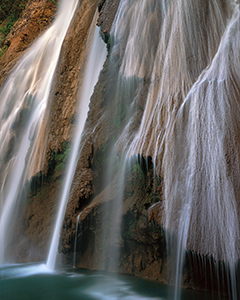 In this context, both beginning and experienced photographers are encouraged to bring a set of representative images – preferably finished matted prints – together with their camera gear. This is not a requirement however, so please do not feel intimidated! A rigorous comparison will also be made of various color printing media available today. 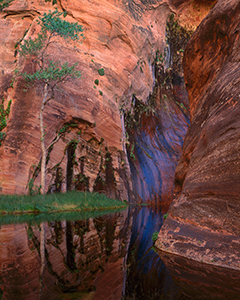 Kenneth Parker is a large-format landscape colorist working principally in remote pristine wilderness areas throughout the world. He is inexorably drawn to elemental forces and their compelling magic, translating into arresting imagery the depths of these feelings, rich in power, radiant. His early experience as field assistant to fine art color pioneer Eliot Porter helped to nurture a discerning loving eye, devoted to isolating and capturing the mysteries in nature that he struggled for decades to unravel as a research scientist in oceanography and global climate change. 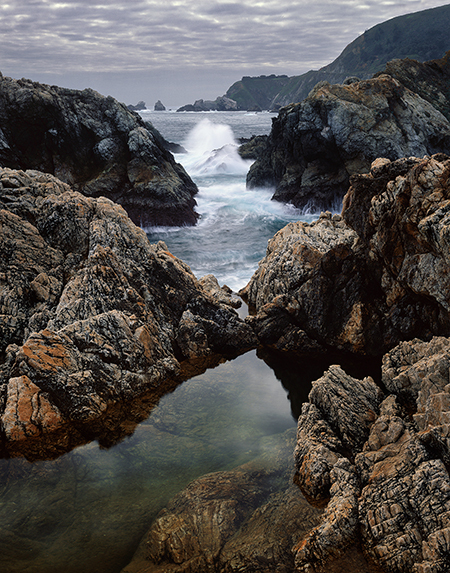 Ken is currently completing the compelling new portfolio Big Sur ~ Gentle Fury with its intimate compositions of the rugged granitic outcrops, tide pools, and powerful wave crashes along this magnificent shore. And a large coffee table publication is currently underway with multi-expedition imagery from the remote kingdom of Mustang high on the Tibetan Plateau – which the Dalai Lama, who is contributing an introduction, has called "the best Tibetan Buddhism that remains in the world". Together with compelling landscapes, and cultural and festival depictions, the volume will feature the monumental 14th century monasteries lying at its heart, the site of a decade of painstaking restorations on what are being recognized as the most magnificent Tantric fresco wall murals ever uncovered in the Tibetan world. Most of Parker’s photographs are captured over the course of 5-10 day backpacking excursions hauling 75-85 pounds of large-format equipment as he becomes immersed in a profound sense of place. Often several days are spent contemplating the changing light and intimacy of a composition before completing a single exposure. Usually only a few distinctive images will result from one of these journeys. Paul Caponigro, who has been a consistent mentor since the 70s, writes: Parker’s stunning prints have impressed me and will no doubt also impress you for their beauty of craft as well as content. Those who will give sufficient time to discover what has been wrought through his efforts will no doubt be rewarded. He has met and mastered the shape of his own passion and vision. And from the lips of the late great Ruth Bernhard at her home: Ken is my favorite color photographer. The way in which he works with light is inspiring. It feels as if he has an arrangement with God. Kenneth Parker is represented in leading galleries and collections nationwide including the renowned Weston Gallery in Carmel and Getty Images, and has been exhibited at the Smithsonian Institution, Oakland Museum, California Academy of Sciences, and the Los Angeles County and San Diego Museums of Natural History. The state of our world today is so fraught with the agonizing inequalities born of blind greed and development frenzy that the more sensitive perceivers among us often feel helpless as precious natural wildness is being run over roughshod. I strive in my photographs to stir in the viewer the magnificence of the taken-for-granted natural becoming the everyday sacred. This can be as rare as angels' tears! When my mind’s eye is open – just as when one's feelings can find words – I begin to hear the music of the spheres. Great patience is demanded in order that I might capture such scintillating resonance. It can shimmer with an unbearably intimate sense of place. It is so palpable! A powerful image is one that can make one feel as if immersed in it, truly willing to be inside its special world... even finally to inhabit it.